I have been wanting to show you the wonderful products that I received from Vanity Trove May box. However, I was too busy with work and other stuff. Hence, the delay. You know how I love organic products and I was truly happy to receive the May box. 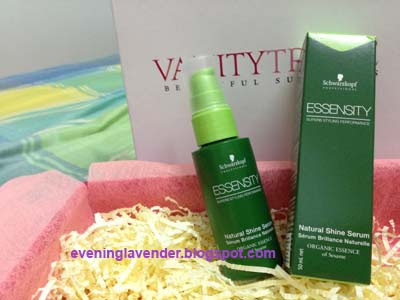 Thanks to Vanity Trove who kindly send me this wonderful box. Let's see the products and you will know what I mean. This soap is chemical free and its ingredients are sourced directly from the Australian Goat Milk farm. I love lavender essential oil. It can be applied straight to burns and cuts or mixed with sweet almond oil as a massage oil. This serum is to tame the frizzy or flyaway hair . It contains essences of organic sesame and olive oils. Rich in Vitamin A and D, rose oil and Rosella extracts, it is effective to treat dry & distressed skin. Suitable for sensitive skin. it can soothe and soften skin. Use it as often as required. Finally, there are also some discount vouchers. 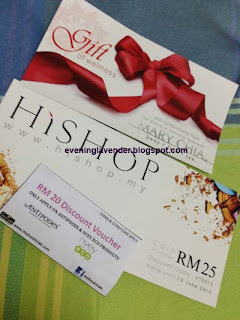 Overall, I think that RM50 is a fair price considering you receive 3 full size products. 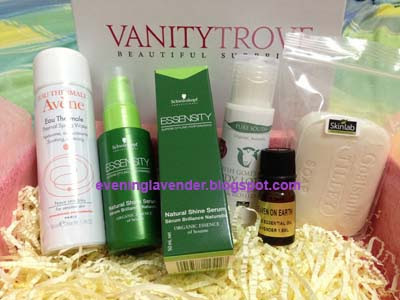 Vanity Trove has improved in their product selection and this time there are so many good stuff in this box. I am very happy because all are organic products and they are either full size or deluxe size.